The Aztec Empire was the empire established by the Mexica people of the city of Tenochtitlan in the region of Central Mexico. The empire had flourishing traditions of art, culture, and literature and had established itself as one of the most powerful Mesoamerican empires. The empire financed itself from the tribute that it extracted from the subjugated city-states and tribes. 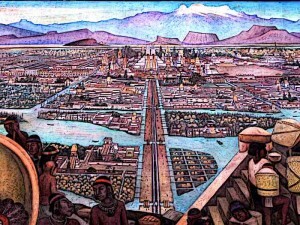 The emperor of the Aztec Empire had his throne in the capital city of Tenochtitlan. The Aztec Empire came into being as a result of alliance between three city states of Tenochtitlan, Texcoco, and Tlacopan. The alliance was known as the “Triple Alliance” and came into being in 1428 after defeating the competing city-states. 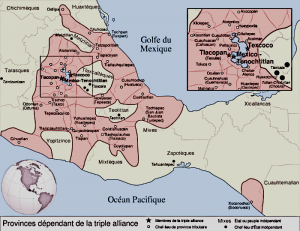 The triple alliance of these city-states ruled the region of Central Mexico from 1428 till the arrival of the Spanish conquistadors and their conquest of the Aztec Empire in 1521. Despite the alliance between these three city-states, the city of Tenochtitlan soon established itself as the dominant military power with the other two city-states assuming the subsidiary roles. The Aztec Empire emerged out of the regional civil war also known as Tepanec War. This began after the death of Tepanec king Tezozomoc in 1426. The Mexica people threw in their lot with the actual heir of Tezozomoc, Tayahauh who was enthroned as the king initially. However, the brother of the king, Maxtla, staged a rebellion and usurped the throne. Against this threat, the city-states of Tenochtitlan, Texcoco, Tlacopan, and Huexotzinco formed an alliance and won victory over Tepanec in 1428. After the war, the city-state of Huexotzinco withdrew from the alliance and what remained was called the Triple Alliance. After the formation of the Aztec Empire in 1428, various imperial reforms were undertaken in the domain of politics and religion. Even the history of the Aztec people was re-written upon the orders of the emperor of the Aztec Empire, Tlacopan. More reforms were undertaken by the next emperor, Motecuzoma I who reshaped the system of tributes from the subjugated city-states. To increase cooperation with the empire, rulers of the subjugated city-states were often allowed to retain their position in exchange for their loyalty. Laws were also issued to separate nobles from the commoners. During the early years of the Aztec Empire, the main focus was on the expansion and consolidation of the empire in the region of Central Mexico in order to increase the influx of tribute, particularly of agricultural goods. The expansion was briefly halted during the four year draught in 1450 but it was resumed after that. Various city-states who had become independent during the years of the tribute had to be re-conquered. Thus during the initial years, the empire saw expansion and consolidation in addition to enactment of various laws. The empire constantly expanded to bring neighbouring city-states into the fold soon after its establishment in 1428. The process of expansion and reforms started during the reign of the very first emperor, Itzcoatl, and continued with the subsequent emperors because conquering of other city-states ensured a steady supply of tribute which was necessary for proper functioning of the empire. During the expansion, the empire came into conflict with the Purepecha Empire in West Mexico but the battle between the two resulted in a disastrous defeat for the Aztec Empire. Thenceforth, the Aztecs avoided the Purepecha Empire and instead conquered other city-states. During the later years of Aztec Empire, the process of expansion and consolidation of the empire continued. Within the empire, culture and trade between different parts of the empire flourished. Emphasis on military training increased and basic military training became necessary for all young males. It was also during the later years that the city-state of Tenochtitlan became the actual centre of the empire. Emperor Motecuzoma II was enthroned in 1502 and under his command, the empire one again tried to invade the Purepecha Empire but once again failed. Imperial reforms also continued during the later years of the empire. The Aztec Empire had a fully developed system of governance other than laws and social hierarchy. The emperors were considered the descendants of gods and thus ruled by divine right. In the social hierarchy, the landowning class was considered nobility other than the priests and warriors. This class enjoyed privileges which were not allowed to the common people. There was a deep stamp of religion on Aztec laws and culture and it was also religion that provided legitimacy to the rule of the emperor and the social hierarchy. The Aztec Empire had centuries-long traditions of arts and culture that flourished under the influence of the ancient Mesoamerican civilisations. Religion was of supreme importance in Aztec culture and society and every household had a place reserved for worship. Religious festivals took place at the end of every 20-day Aztec month. The Aztec empire was a class society with royalty sitting at the top end of the hierarchy. It was followed by the nobility which, other than the land-owning class, also included the warriors and priests. Common Aztec people indulged in various professions such as farming, trading, craftsmanship, and others. The first ruler of the Aztec Empire was Itzcoatl who ruled from 1427 till his death in 1440. He was followed by Mectezuma I who ruled the empire from 1440 till 1469. Subsequent rulers of the Aztec Empire included Axayacatl ruling from 1469 to 1481, Tizoc ruling from 1481 till 1486, and others. On the eve of the Spanish Conquest, the ruler of the Aztec Empire was Cuauhtemoc. The Aztec Empire was conquered by the Spaniards under the command of the adventurous conquistador, Hernan Cortes. His initial contact with the Aztecs was friendly and he was welcomed by the emperor himself. However, later on, misunderstandings developed between the Spaniards and the Aztecs which gave rise to open hostilities. The absence of horse and canon in Aztec Empire was a clear disadvantage and thus Cortes and his men were able to defeat the Aztec army. The city of Tenochtitlan was destroyed, to be constructed later by the spanish conquerors along new lines. 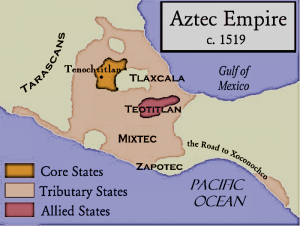 The Aztec Empire emerged out of the triple alliance between the city-states of Tenochtitlan, Texcoco, and Tlacopan. The empire was established in 1428 and continued to expand and consolidate its rule over the neighbouring city-states until its conquest by the Spanish conquistador Hernan Cortes in 1521. The Aztec Empire had a fully developed system of governance and flourishing traditions of arts and culture spanning over several centuries.